CASE #1: Your child just brought his horse to the house through the front yard, even though you don’t want horses leaving manure piles on the lawn or trampling the flower beds. But little Billy is in a hurry because he forgot something and didn’t want to ride around through the barnyard to the back door. He ties old Trusty to a shrub by the sidewalk and runs inside. When he returns, he finds Trusty collapsed on the lawn, jerking and trembling. CASE #2: It’s a crisp Fall morning and you’re going for a ride. But when you go to the pasture to get your horse, he’s by the bushes along the creek and doesn’t come. As you approach him you see he is agitated and breathing heavily. At first you think he’s been running and exerting, then you see his neck muscles trembling, his eyes watering, and he staggers when he walks toward you. CASE #3: Your horses have been grazing a pasture where a number of weeds have been encroaching from the dry roadway next to it. Today you notice that one of the horses seems to have trouble eating and acts like there is something stuck in his mouth or throat. He is holding his mouth open, flicking his tongue in and out of the mouth and making chewing movements. He also seems a little dull and drowsy. All three of these horses were poisoned. In Case #1, old Trusty was gasping for breath and died before you could arrive on the scene, alerted by your son’s screams. Your veterinarian’s diagnosis is yew poisoning; the shrub in your yard contains a highly poisonous alkaloid called taxine, which has a strong depressing affect on the heart. Just a couple bites of this evergreen will kill a horse very quickly. Case #2 was chokecherry poisoning. Wilted leaves after fall frosts contain a chemical that produces cyanide under the right conditions — a very fast-acting poison. Most poisoned animals are dead by the time you find them, for they rarely survive more than one or two hours after eating the wilted leaves. But prompt treatment with intravenous injection of sodium nitrite and sodium thiosulfate can counteract the poison (the first ingredient combines with it to produce a non-toxic compound which is taken up and absorbed by the other ingredient so it can be harmlessly excreted from the body). If your vet got there in time and had the proper chemicals with him, he could save your horse. Case #3 was poisoning from eating yellow star thistle — a noxious weed that is spreading and becoming more common in many states. Some horses, after sampling it, develop a taste for it and may eat enough to permanently damage their brain. Some of the signs of poisoning include twitching lips, open mouth and involuntary chewing movements; it’s often been called “chewing disease”. Affected animals have trouble eating and drinking but are still able to swallow. Muscles of the jaw and lips eventually become rigid and the horse can’t grasp or chew food. 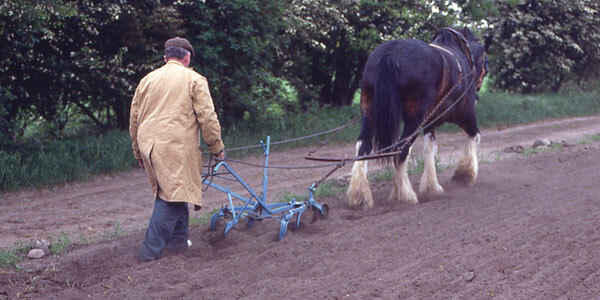 Poisoning sometimes occurs in horses; various plants are toxic. The horse owner must try to make sure there are no poisonous plants, trees or shrubs in the pasture or hanging over the fence. Some of the toxic substances or plants that a horse might taste or chew on, even in small quantities, can cause death. You don’t always know what you are dealing with when you discover a sick horse. Poisoning can have a wide variety of symptoms, since some poisons affect the digestive tract and cause colic as a first sign while others affect the nervous system and cause the horse to become uncoordinated and staggering or mentally deranged. Other toxins may cause slobbering. It can be difficult to determine whether you are dealing with poisoning or some type of infectious disease. And unless you know what the animal ate, you won’t know what to do for emergency treatment, since treatment will differ for different poisons. If you suspect poisoning, get immediate veterinary help, and try to figure out what the animal might have eaten. If treated in time, some kinds of poisoning can be resolved and the horse will fully recover. But other poisons may leave him permanently disabled, and still others are almost always fatal. If your vet can determine from symptoms and any other evidence what the horse ate, he can more readily give proper treatment — if there is an antidote that will work for that particular poison. Depending on the toxin involved, he may try to remove any residual poison from the gut with purgatives and an adsorbent like activated charcoal, which collects some types of poison. 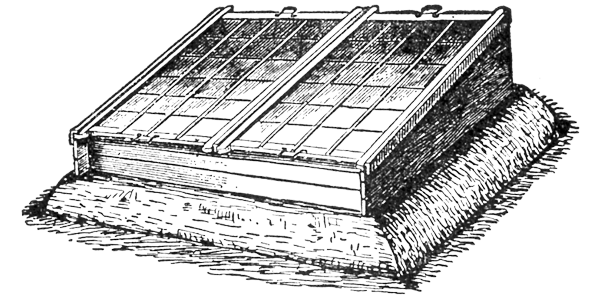 A purgative (such as mineral oil) hurries the offending material on out. There are many plants that can cause illness and death in horses. Some can vary in toxicity while others are always extremely poisonous. 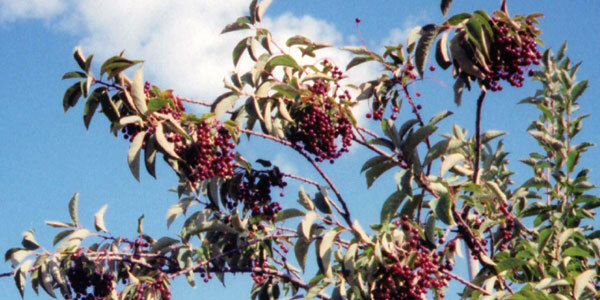 Some are harmless under normal conditions (in small amounts or at certain seasons) but prove poisonous if eaten in large amounts or if chemically changed by freezing or enzyme activity (such as glycosides in chokecherry leaves which can turn into deadly cyanide). Poisoning often depends on palatability (some deadly plants are readily eaten by horses and others are not, unless a pasture is overgrazed and feed is short, or the horse is bored and nibbling), stage of development, conditions under which it grew (drought or freezing may increase toxicity levels), portion eaten (some have highest concentration of poison in roots, seeds, or new sprouts). Harmful plants may be inadvertently baled in hay, or given to horses in lawn or hedge trimmings. Some plants and shrubs used in landscaping (yard or garden, barnyard or fairgrounds) or growing along a fencerow, road, trail or ditch bank may be poisonous. A horse may nibble the shrubs that hang over or through his paddock fence, or nip off plants along the trail or at a rest stop when you are riding, if you aren’t paying attention to what he’s doing. Plant poisoning should also be suspected if horses experience sudden illness or death after being moved to a new pasture or fed different hay. Poisonous weeds in hay can be a danger, since the hay-fed horse has no other food options (as does a horse at pasture). Some horses will sift and sort out the strange weeds, but greedy eaters may eat them. Even a not-so-hungry horse may eat harmful hay because the strange or obnoxious taste of the live poisonous plant may have decreased during the drying process. The best way to avoid plant poisoning is to make sure your hay is good quality, containing no weeds, and familiarize yourself with the types of poisonous plants that grow in your geographic region or climate. Make sure none are growing in your pasture. Look at all the plants in a pasture or paddock before putting horses in, including the trees and shrubs, even if they are on the outside of the fenceline but within reach of horses. If unsure about identity of plants or trees, take leaf samples to your county extension agent. Some plants are easily eradicated (taking out a tree or hedge, or several individual plants growing along a fence or ditch) but large patches may require herbicides. Your extension agent can advise you on how best to get rid of them. Make sure no trimmings, pruned branches or discarded garden plants or weeds get put in or near your horse pasture or pens. Bored or curious horses may nibble strange plants, even reaching under or through a fence to taste them. Never let a horse have access to ornamental shrubbery or flowers, and remove any fallen tree limbs from pen or pasture immediately after a storm. If using straw for bedding, inspect it carefully as you put it into stalls, to make sure there are no weeds in it. When feeding hay, inspect it for strange plants and discard anything you aren’t sure about. Horses usually avoid poisonous plants, but hunger, curiosity or boredom may lead them to try things they shouldn’t. If you ever suspect a horse may have eaten something toxic (showing behavioral changes, digestive upset or any unusual signs), get veterinary help immediately. Some types of poisonings are irreversible and always fatal, but others can be resolved with fast emergency treatment. Do all you can to prevent such problems, but also be prepared to act fast if the suspicion of poison should ever arise. Garden flowers and plants that are poisonous include buttercup, narcissus, daffodil, lily of the valley and delphinium. 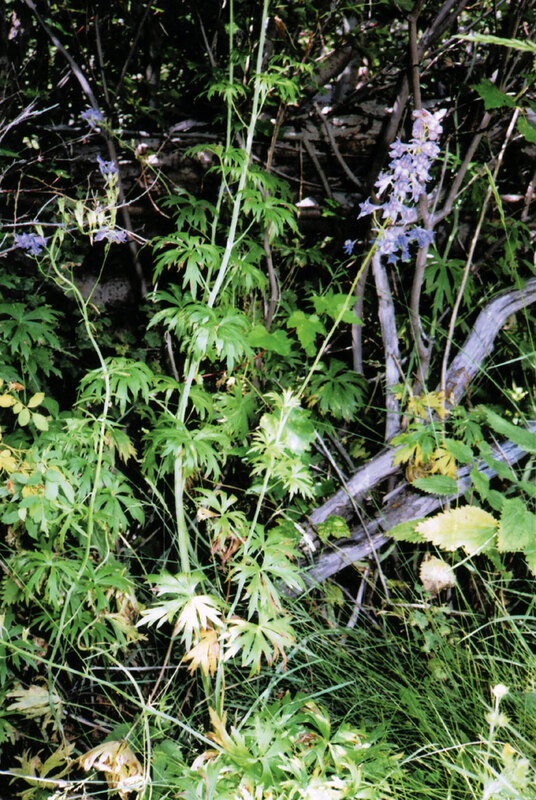 Wild delphinium is called larkspur. Rhubarb leaves contain oxylates that may crystallize in the kidneys, causing kidney failure and death. 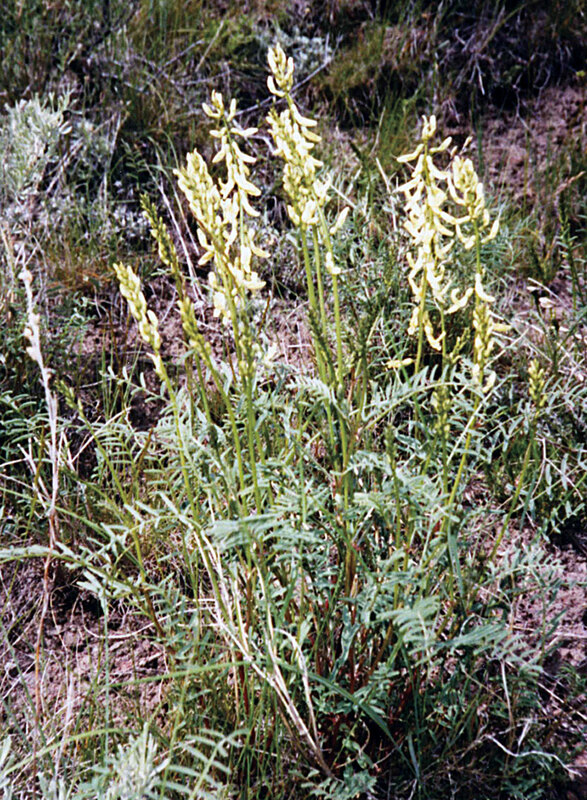 Other plants that may poison horses include brackenfern, cocklebur, castor beans (grown as a crop in some areas), crotalaria (sometimes called rattleweed or showy crotalaria), death camus, equisetum (horsetail), fiddleneck, fireweed, tar weed, buckthorn, yellow burr weed, lantana (an ornamental flower), locoweed, nightshade, jimsonweed, ground cherry, poison hemlock, water hemlock, Russian knapweed, yellow star thistle, the senecios (groundsel, stinking willie, ragwort, tansy ragwort), Saint-John’s-wort (also called Klamath weed or goat weed) and white snakeroot. Potato skins can also poison to horses. There are hundreds of toxic plants, but some only grow in certain geographic areas — so you need to find out which ones might be a problem where you live. There are a few grasses that are toxic to horses, including torpedo grass (a lush pasture grass in Florida and the South), Sorghum and Sudan grass are common in the Southwest and Southeast and both can be harmful under certain conditions. Their toxic effects may be intensified during drought or after a frost. Trees and shrubs that can cause problems for horses include chokecherry, black locust, red maple, black walnut, rayless goldenrod (a bushy perennial shrub), Oleander (a common ornamental shrub), and yew (which can be a small tree or a shrub). Other trees that can be mildly toxic if nibbled by horses include oak, Ohio buckeye, and the Kentucky coffee tree. There are many plants that can cause illness, death, abortion, metabolic disorders and other problems in cattle. Death loss varies annually (USDA estimates average loss between 3 and 5%) but there are other economic losses also, due to poor rate of gain or reproductive losses from toxic effects. Many plants are classified as poisonous, but some vary greatly in toxicity, depending on conditions under which poisoning occurs. Some make good feed in small amounts or in certain seasons — but are poisonous in different situations. Some contain substances directly poisonous to livestock, such as the alkaloids in lupines and larkspur. Others contain elements that are harmless until they become chemically changed by freezing or enzyme activity, such as the glycosides in chokecherry leaves — which can become deadly cyanide. Some absorb substances from the soil and accumulate these to toxic levels, such as selenium in locoweed and other milkvetches. Poisoning of livestock depends on several factors, including palatability of the plant (some are readily eaten; others aren’t unless good feed is in short supply), stage of development, conditions in which they grew (some species of saltbush are good forage except when grown in soils high in selenium), moisture content of the plant, part eaten (some have more poison in the roots, seeds, or some other part). Plant poisoning can be suspected if cattle are moved to new pasture or fed different hay and there is sudden onset of illness or deaths. Since many poisonous plants cause death quickly, treatment may be useless; the animal is often dead when discovered. Find out what plants grow in your fields and pastures and along the fence lines, and how to avoid situations that may lead to poisoning. Different regions have different problems, and some plants may not pose a threat except under specific circumstances. For instance, in western states death camus, hemlock, larkspur and locoweed are common problems, along with pine needle abortions. In the Midwest some of the most common poisonings are due to poison hemlock, brackenfern, cocklebur (in early spring in its two-leaf growth stage, or if seeds end up in grain), horsetail and Johnson-grass. The latter can produce cyanide poisoning if grazed after a hard frost, or after drought conditions that produce slower growth of the plant. In Missouri some of the most common problems are due to oak or buckeye (trees or shrubs). Other problem plants in that state are chokecherry (especially in late spring after a late frost has wilted the leaves), cocklebur, hemlock and pigweed. Buckeye also causes some poisonings since it is one of the first trees to bud out and is often the first green thing in the spring, making it attractive to cattle. Poisonings in Texas are often due to the milkweeds, locoweed, Texas buckeye, redroot pigweed, jimsonweed, low larkspur, yellow sweetclover and African rue (an exotic plant that has spread onto rangelands in Arizona and Texas). Other states and climate areas will have a different set of plants and problems. Types and quantities of poisonous plants consumed by cattle also vary greatly depending on management and pasture conditions. Overgrazed pastures and ranges may have more poison problems since cattle are forced to eat more of the less palatable (and possibly poisonous) plants. Moving hungry cattle into pastures with high densities of poison plants can cause losses, since animals graze less selectively when hungry. 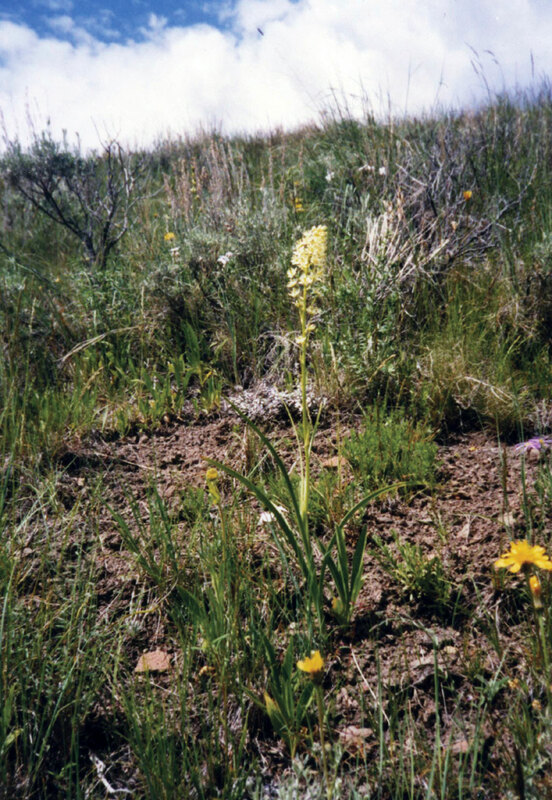 Turning cattle into pastures that aren’t quite ready to be grazed may result in poisoning, since some of the offending plants — such as low larkspur, lupine, death camus, oak, etc. — are early sprouters and will be in their most palatable and succulent stages ahead of the grass. Examine your pastures for poisonous plants before moving cattle into them. A late spring or early fall snow may cover the shorter, more desirable plants, leaving taller ones (like tall larkspur or lupine) more available to livestock. 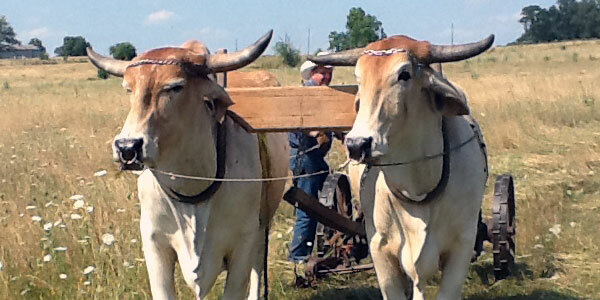 Storms may bring down branches or whole trees that may be eaten by hungry cattle. Heavy rain may increase livestock losses since some plants become more toxic after a rain, or the ground is softened so roots and bulbs (which may be toxic) can be pulled up. Stormy weather may cause cattle to take shelter in wooded or brushy areas, eating strange plants that grow in shaded soils, rather than going out to graze. In drought areas many of the more palatable plants mature faster and dry up, while some of the poisonous ones stay greener, and more readily eaten. In these situations, livestock should be moved to different pastures or given supplemental feed to make sure they won’t consume lethal quantities of poisonous plants. There are hundreds of plants that can be toxic to livestock. Some grow in specific regions while others are more widespread. Some are always a serious danger and others only under certain conditions. This article covers only some of the common offenders and may not cover the worst plants in your area. To find out which plants to watch for in your region, talk to your vet or extension agent. Your vet can advise you on treatment if poisonings occur. 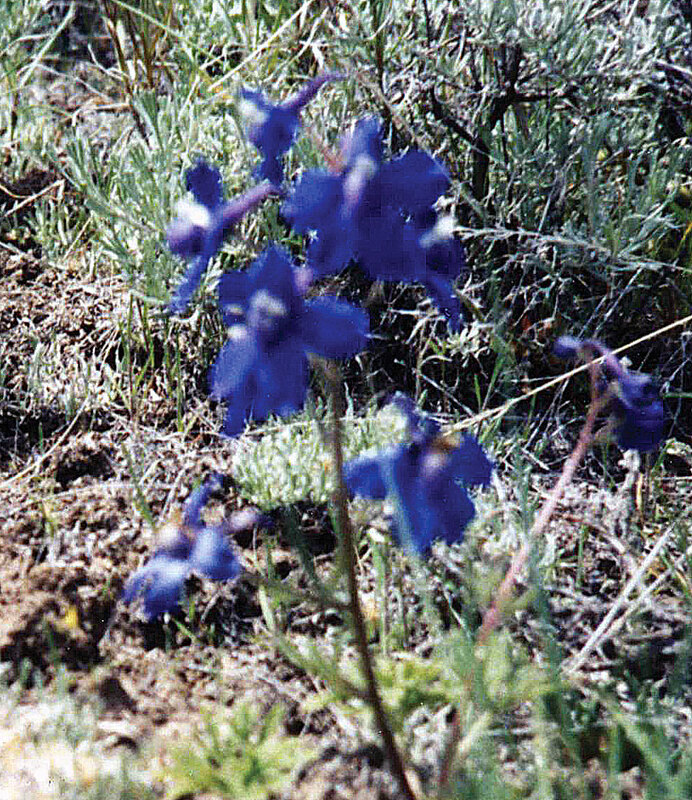 LARKSPUR – Two types of wild delphinium are poisonous to cattle. Low larkspur (6-24 inches high) has deep blue to purple flowers growing in dry to moderately moist soil on plains, foothills and mountains. It blooms in early spring and is most poisonous when young. Spring is the most dangerous time since cattle often eat it even when good forage is available. Losses can be prevented by keeping cattle off heavily infested pastures until after the plants have flowered. 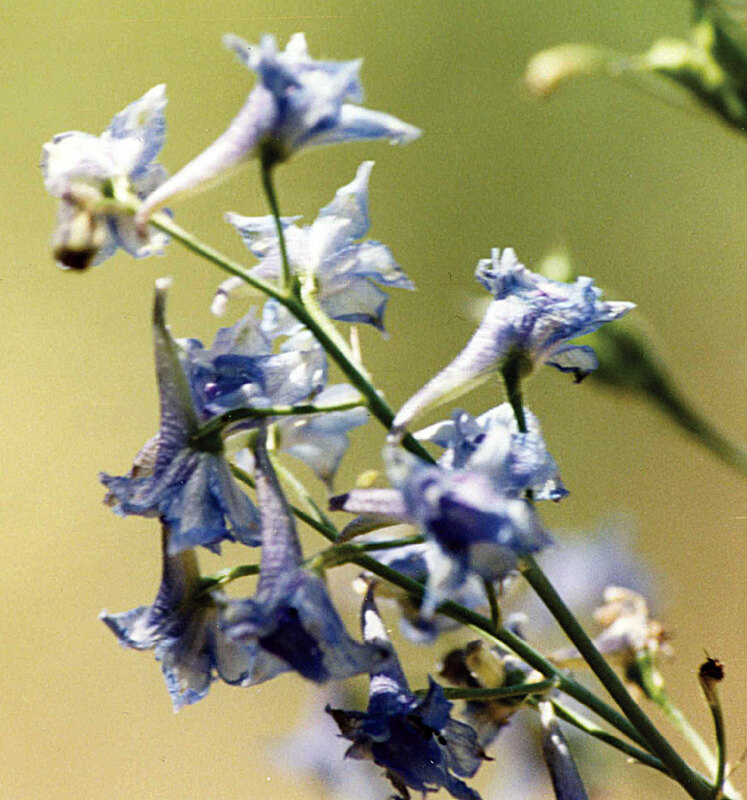 Tall larkspur grows 3 to 7 feet tall, with a deep woody root. Flowers are blue. Tall larkspur grows in thick stands and prefers moist and shaded areas such as along streams, springs or aspen groves. 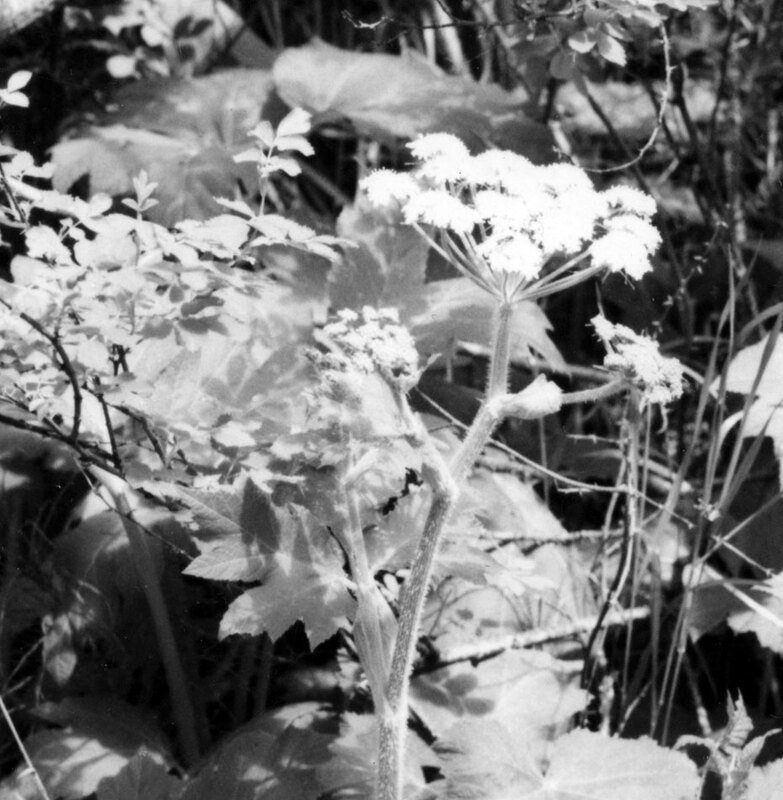 It matures and flowers later; poisoning is most common in mid summer. Poison content is high during early growth, drops when the plant is mature, but is high again in the dry plant. Symptoms of poisoning occur within a few hours of eating the plants, with muscle tremors and collapse. The gut becomes paralyzed (causing bloat) and death is usually due to heart failure and respiratory distress. Most affected cattle die even with treatment. Small amounts, mixed with other feed, have no harmful effects. HEMLOCK – Poison hemlock (carrot family) — not to be confused with water hemlock which is more poisonous but more rarely eaten — grows 2 to 10 feet tall with hollow, purple-spotted stems and solid taproot. Leaves are finely divided, like carrot, and smell like parsnip when bruised. Poisoning is most common in spring when the tender, highly toxic new leaves appear. Cattle generally won’t eat hemlock unless there is shortage of other feed. It is often found along roadsides, edges of fields or along creeks and ditches. If eaten, it causes incoordination, drooling and abdominal pain. Death is usually due to respiratory failure. LOCOWEED – Common in the West, locoweed is also called crazyweed, milkvetch or poisonvetch. It grows on arid and semi-arid ranges; there are more than 50 kinds. It is a legume (pea family), with pea-like leaves, blossoms and seedpods. Most grow on selenium-rich soils and concentrate selenium in their tissues. 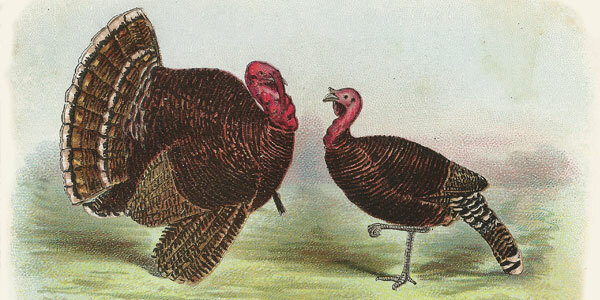 Some types are unpalatable and are only eaten when feed is short (as in dry years or when grass is late starting in spring) while others are quite palatable — such as timber milkvetch — and can vary in toxicity, ranging from high protein forage plants to extremely poisonous. Some types are addictive. Once an animal starts eating it, the animal seeks it out. The poison can be cumulative, building up to dangerous levels over time (a few days or weeks) or death may occur within a few hours of eating the plants. Signs of poisoning include nervousness, weakness, emaciation, depraved appetite, poor vision, incoordination and difficult breathing. In fatal cases, death results from heart failure or respiratory paralysis. BRACKENFERN – Part of the fern family, this large perennial herb grows in burned-over areas, woods and shady places, and on dry, sandy or gravelly soil. 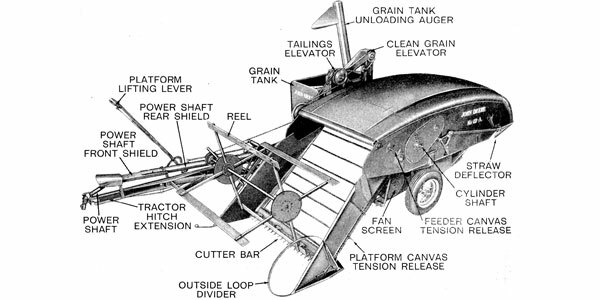 Cattle may eat it when other feed is short or when mixed in hay. Poisoning is cumulative, eventually causing high temperature, difficult breathing, loss of appetite, drooling, dullness, nasal and rectal bleeding, blood in urine, and hemorrage of mucous membranes. Once symptoms appear, the animal soon dies. The leaves of brackenfern are poisonous whether green or dried. HORSETAIL – Also called scouring rush or jointfir, this member of the Equisetum family grows in meadows, flood plain, or wherever the water table is high. It may grow in meadow hay. Poisoning is cumulative and may occur after eating hay containing large amounts or when animals graze pastures short. The young green plant is most poisonous, and young animals are more readily poisoned than mature ones. Symptoms include excitement, muscle weakness, trembling, staggering, diarrhea and loss of condition. HALOGETON – This annual looks like Russian thistle or tumbleweed and thrives on salty soils in semi-arid regions. Halogeton becomes more toxic as it grows, reaching peak toxicity at maturity. Cattle don’t generally eat it when better feed is available but may be poisoned in fall or early winter if driven along roads or trails where it grows. If a lethal dose is eaten (sometimes less than 1% of body weight) the animal becomes dull and weak, collapses with difficult breathing, goes into a coma and soon dies. 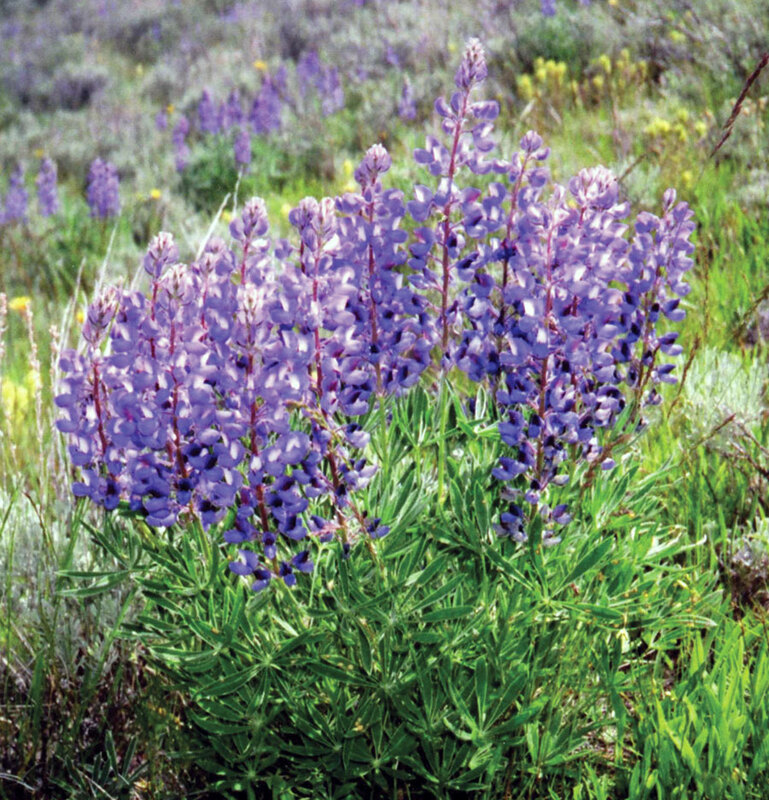 LUPINE – Lupines are perennials of the pea family, 1/2 to 3 feet tall. There are several types, growing on mountain slopes, valleys or plains, grasslands, sagebrush or forest land. Lupine is more deadly to sheep than cattle, but if pregnant cows eat it between 40 and 70 days of pregnancy they may give birth to malformed calves with crooked legs, twisted spine, cleft palate or other abnormalities. SWEETCLOVER – This legume is not a problem while green and growing but becomes toxic when damaged or spoiled, in hay or silage. When the spoiled plant molds, a toxin is produced that interferes with blood clotting. Large amounts of moldy sweetclover (generally after the animal has been eating toxic silage or hay for at least 2 weeks) cause swellings on the body and the animal may become dull and stiff. Pulse is fast and weak, and death is due to internal hemorrhage. Animals suffering from sweetclover poisoning may bleed to death from small wounds, dehorning, or castrating. PINE – Ponderosa (yellow pine) can cause abortion if needles and buds are eaten. Abortion usually occurs about 2 weeks after the cow begins eating it. Cows seem normal up to the time of abortion, then have weak contractions, uterine hemorrhage, incomplete dilation of the cervix, and retained placenta. In many cases the cow will die from secondary infection and complications unless given treatment and supportive care. Some suffer liver damage. 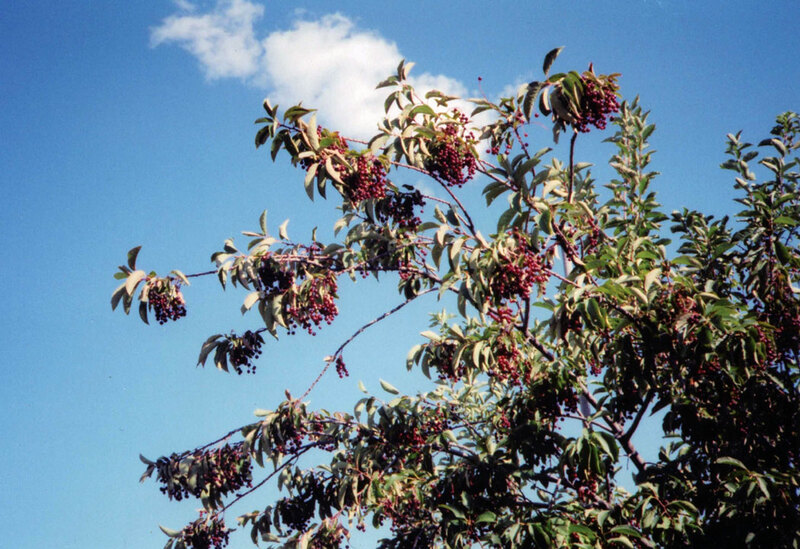 CHOKECHERRY – The wild cherry is a large shrub or small tree with dark green leaves, clusters of white blossoms and dark red or black fruit. The leaves contain glycosides which can produce cyanide and hydrocyanic acid poisoning in cattle. 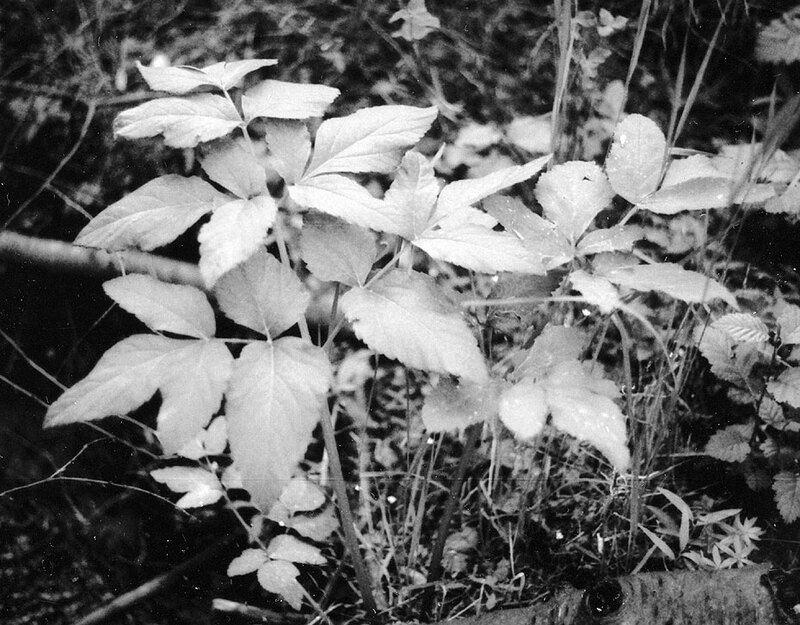 Wilted or frost-bitten leaves are most poisonous. The cyanide is a fast-acting poison; the animal generally dies within 30 minutes to an hour after eating a fatal dose. About 2.5 pounds of leaves will kill a cow. OAK – Oak poisoning is common in the Southwest. There are many types of oaks but all may be toxic to cattle. Toxicity is highest when cattle eat leaves and sprouts. Signs of poisoning may occur within a week after they start browsing on oak. Affected cattle stop eating and suffer rumen shutdown, constipation and abdominal pain, thirst and frequent urination. Small amounts of hard brownish-black pellets are passed, which changes to diarrhea if the animal stays alive. Oak poisoning is common in spring, and sometimes in fall if acorns are eaten. YEW – This ornamental evergreen shrub (Japa- nese yew, English yew, ground hemlock) is often used in hedges or landscaping around homes and yards, fencelines, driveways, or show barns. It contains a very toxic alkaloid that can cause sudden death to any animal that nibbles even a few bites. The poison stops the heart. OTHER PLANTS – Some of the common plants that can affect cattle are arrowgrass (which grows in marshy pastures and is readily eaten by salt-hungry cattle), birdsfoot trefoil, sudangrass, johnsongrass and reed canarygrass. All of these can cause problems when stunted from lack of moisture or wilted by frost, since they all contain the same toxin as chokecherry. Cocklebur can be poisonous if eaten in early spring at its 2-leaf stage. Pigweed, jimsonweed, yellow star thistle, tansy mustard, death camus, buckeye (horsechestnut), greasewood, prince’s plume, are some of the many plants that can cause problems. A fungus (ergot) can grow on grasses (replacing seedhead with a dark brown or black mass) when moisture conditions are right, producing toxic alkaloids that cause convulsions and paralysis, or gangrene of the extremities (ears, tail or feet may die because of reduced blood circulation). If you suspect plant poisoning, consult your veterinarian and county agent to try to identify the cause and prevent further problems by eliminating the plant or changing your grazing management to minimize its effects.